Mercedes-Benz New York Fashion Week Spring 2013 was like a giant, joyful burst of confetti in every shade imaginable. Are you ready for these bold hues? What does the ultimate New York fashionista look like? If you’re picturing a serious girl dressed in head-to-toe black, wearing oversized sunglasses, dark red lips and clutching a Starbucks latte, you wouldn’t be the only one. This stereotype of the high fashion woman sometimes hits a little too close to the truth. But don’t let that cloud your vision of the recent runways. This past Fashion Week, designers dressed their models in everything but black. 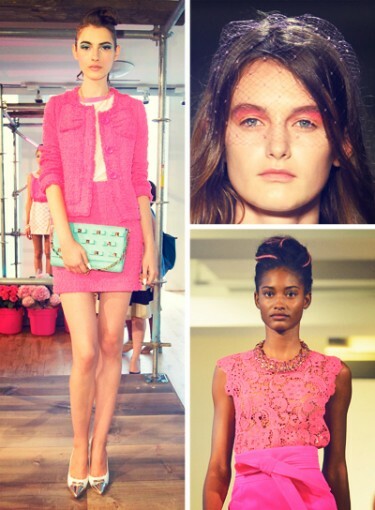 In fact, when it came to color, the Spring 2013 shows were like one delicious slice of funfetti cake. Click here to see the hottest colors of Fashion Week. From yellow nail art at Kate Spade and Pepto pink swimsuits at Betsey Johnson to tangerine dresses at Jenny Packham and blue hair at Oscar de la Renta, Fashion Week was all about bright color. The standout shades of Fashion Week were so joyful just looking at them makes us want to jump up and do a little happy dance. After all, at its core fashion should be fun, right? Isn’t the whole industry about creativity and imagination? So put on your rose (or blue, or green, or … you get the picture) colored glasses and get ready for a kaleidoscopic celebration of all things colorful.